I guess you could say I haven't really been in the 'bloggy' mood lately. For some reason, I feel like we have been so busy....having some sort of commitment each day. And not that it's a bad thing, I just can't seem to get caught up or think straight, it seems. So today I thought that I'd do some catching up. Nothing too exciting, but it's something. I'll start out by telling you about how much of a challenge Parker has been for us lately. She's a sweetheart. She really is. But geez Louise....she has really given us a run for our money! It's not just the whining.....or the fit throwing. But really...it's the blatant disobedience and disrespect for us, and for other people as well. Is this just the "terrible two's" that we've all heard about...and quite possibly dismissed or even laughed about?? Because if it is...then ok. Fine. Although I am far from laughing now, maybe one day I will?? But what if it's more? What if this is the behavior that we have shaped? Is it something that we have done, or not done, as her parents? I'm really trying not to take myself too seriously here because a) I am a little low on sleep these days, and b) she is two. But honestly- in the back of my mind I am always wondering if this is just a phase or is this something that if we ignore, or just don't take that seriously....would she continue to have these behaviors as a 6 year old? An 11 year old? A sixteen year old, God forbid?? And the really big thing....the thing I think that might be stressing me the most is bedtime. I know I shouldn't let it get to me like it does......but this issue has really been going on since last October when we first took her out of her crib....and by the end of the day I am exhausted...and I am ready for the day to end! I've written about our bedtime routine before, so I won't go through it again....but I will say that Parker continues to keep getting out of bed....and if I am not dealing with Grace at the time....I just do the whole Super Nanny thing and just keep putting her back in her bed. But when I am dealing with Grace, this becomes more of an issue. Not to mention the fact that she is SO TIRED....and we know that she is SO TIRED....and I think this effects her behavior, as well. For me to spend a little more one-on-one time with Parker. It seems that maybe the days that I get to spend more quality time with her she is better towards me. And since Grace came, I have obviously had to give her much of my attention. And although Parker appears to love her sister and doesn't really act out towards her....there are times (like bedtime) when she will be throwing her fit and will say, "No Mommy...don't hold Grace!" And she'll say this a few times and it really does break my heart....but what am I to do? I do let Grace cry at times just so that I can hold Parker for 1 minute to hopefully let her know that I choose her, too. But anyway. Something that keeps popping into my head lately is something that I learned when I was a teacher.....'if a kid is not getting the attention that they need or think that they need....they are going to get it some way....even if it is negative attention.' And yes- I realize I may be reading way into it....but this has been going on for a while and is progressively getting worse and we are progressively getting more tired and frustrated with it. So enough of all of that! It's so good to get that off of my chest! This is some of what has been running around in my head for weeks now! 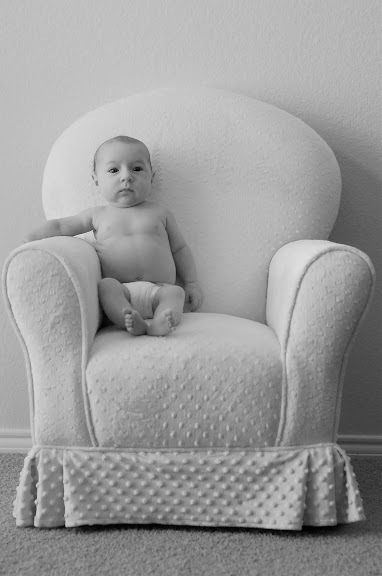 I'll end with posting Grace's 2 months picture in her growth chair that I failed to do last week. 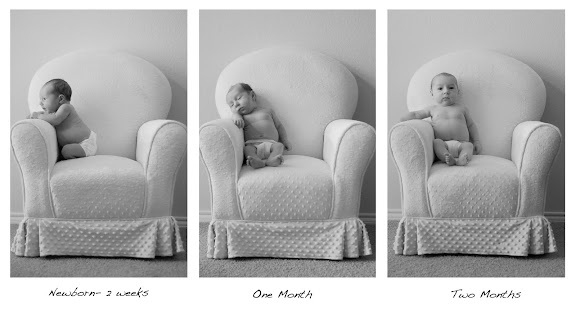 And then I went ahead and compiled the newborn picture, 1 month picture, and the 2 months picture for our viewing pleasure! CANNOT believe how much she's grown! She's really starting to fill out! Hang in there, you are doing a great job. I'm sure this is just a phase and just like any other phase, she will grow out of it. Even though I'm sure you are hoping for sooner than later, it will eventually pass. I am so glad you are so open and honest on your blogs, it really gives me an insight of what's to come. Hang in there! It is going to be okay! Ya'll are doing a great job. She is having to adjust to so many things. I was never an expert on anything like this so can't give you much advice other than keep on doing what ya'll are doing! She is going through a stage and she loves Grace but is not quite sure she needs to share your love yet. She's a precious little sweet girl! Grace is beautiful, love the pics! Love the pictures! You can really tell how much Grace has grown in the past couple of months! Cute little smile from Miss Parker Ann! I must say, I read this post last night and came back today in hopes of reading good advice from others. It seems like everything you said about Parker, we are having the same issues with Jackson and Garrett. Parker is adjusting to a new sister and all the changes that brings while Jackson & Garrett are adjusting to our "temporary living situation." We are now struggling with bed time, not following directions, fighting and not sharing, and MAJOR meltdowns from Jackson. It is emotionally draining and I often wonder what I can do differently. I did bring this up with Dr. Halsell the other day and she simply nodded her head like it was perfectly normal. If you find the magic trick let me know. Parker is a sweetheart and you and Geoff are both wonderful parents. Don't blame yourself, stay positive and consistent and things will get better. They have to! I really think it is the age. Abby is doing the same things. Really. I would believe those were my words you wrote if I didn't know better. And I have the same thoughts that you do - did we create this behavior with our parenting style... will she always be like this... But then I talk to other people and see other kids her age and they say/do the same things. Does that make it easier? No. You are a great mom and you just need to do what works! Call me and maybe we can come up with something we can both try!